Henry George Birthplace staff recently organized and uploaded a new collection of documents related to the Intermountain Single Tax Association (ISTA). The ISTA formed in 1985 when James L. Busey and Earl A. Hanson merged two organizations committed to tax reform along Georgist lines: the Colorado Single Tax Association and Utahns for Tax Reforms. Busey, Professor Emeritus of Political Science from the University of Colorado served as President of the ISTA while Hanson, a retired electrical engineer was Secretary. Series One features Busey’s correspondence and publications and Series Two features those of Hanson. The stated purpose of the joint organization was to secure “popular and legislative recognition and acceptance of the elimination or reduction of taxation of labor and capital, while shifting it to unearned land values.” The ISTA hosted several regional conferences and organized local events around tax reform. Additionally, ISTA members worked within other organizations to achieve recognition and acceptance of land value taxation theory. 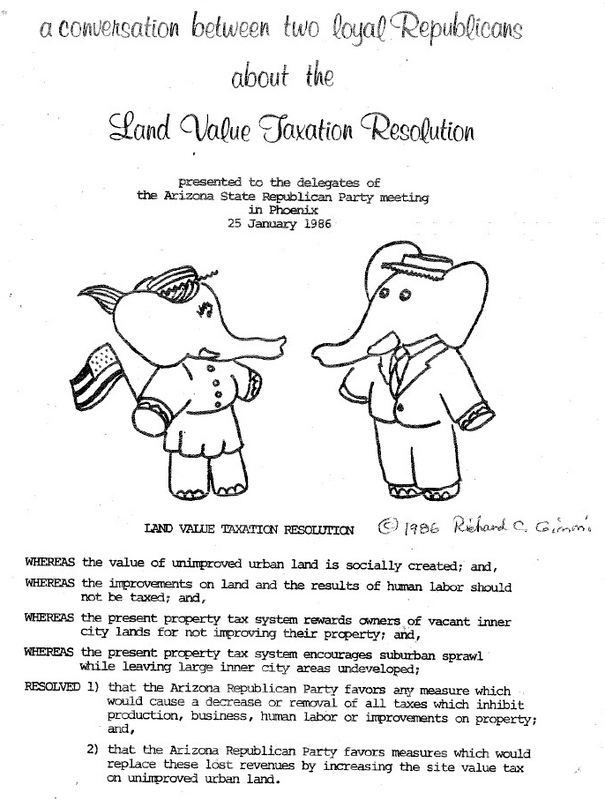 RESOLVED 1) that the Arizona Republican Party favors any measure which would cause a decrease or removal of all taxes which inhibit production, business, human labor or improvements on property; and, 2) that the Arizona Republican Party favors measures which would replace those lost revenues by increasing the site value tax on unimproved urban land. In 1986 and 1990, ISTA member Don Pinson ran for real estate assessor for Clark County, NV. Both times he was defeated by the incumbent Jean Sutton, who held the office from 1974 until 1996. Some of Pinson’s campaign material is found in Series Three. 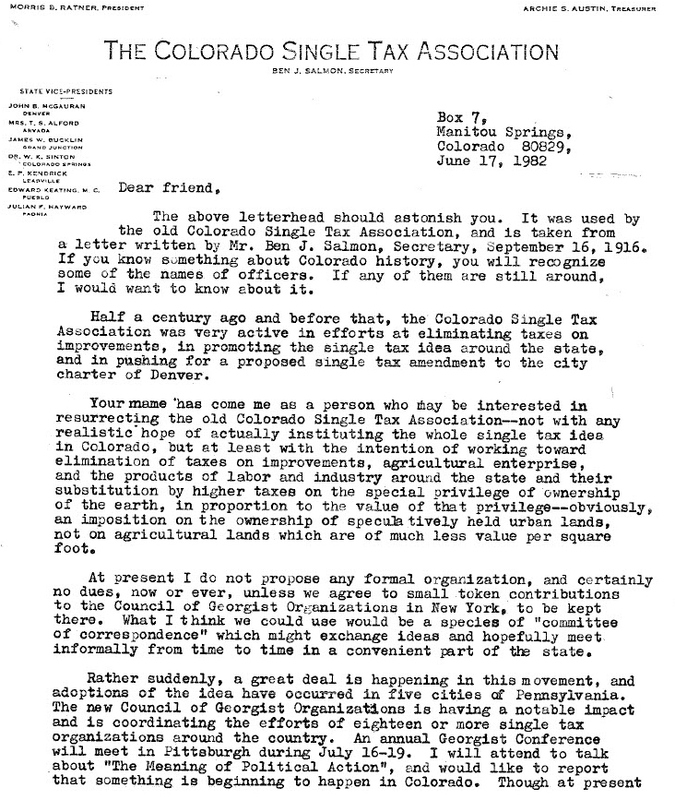 Among the writings of ISTA President Busey, Series One also contains several letters Busey penned on the letterhead of the original Colorado Single Tax Association, which formed around the turn of the twentieth century. Single tax agitation in the Centennial State was especially high in the aftermath of a State Senate resolution passed in 1899 that appointed a commission to study and recommend changes to Colorado’s tax laws. Chaired by avid single taxer James W. Bucklin, the special commission recommended a constitutional amendment that would allow for home rule in taxation. At that time cities in Colorado, and in many other parts of the country, lacked the authority to alter local tax policy. Home rule would allow cities to shift the burden of property taxation away from improvements and onto land values. The Colorado Legislature approved—by a relatively wide margin—a measure to submit such an amendment to the voters of the state at the next general election. On November 4, 1902, voters narrowly defeated the measure.